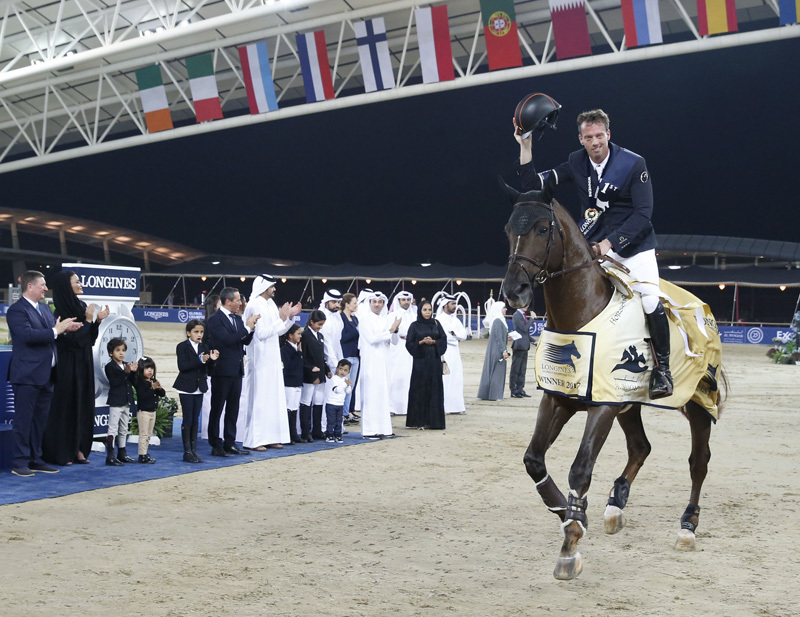 It was a night of sporting jubilation and celebration as Harrie Smolders was officially crowned 2017 Longines Global Champions Tour series champion and local hero Bassem Hassan Mohammed delivered an emotional home victory in the immense floodlit arena of AL SHAQAB in Qatar. After 15 Longines Global Champions Tour grand prix classes across the world, consistently featuring the best riders and horses, the final event of the season unfolded with a magical Hollywood ending. Spectators of all ages held their breath as Qatari rider Bassem Hassan Mohammed, riding Gunder, demonstrated nerves of steel in the nine-strong jump off and swept home clear to win the final LGCT grand prix of the season—a full 2 seconds ahead of Janika Sprunger of Switzerland on Bacardi VDL and Peder Fredricson of Sweden on H&M Christian K.
“Today we made it,” said Mohammed. “It’s been really hard work; I’d like to thank my whole team and my horse. I’m so happy, so proud. It feels very special to make this crowd happy. 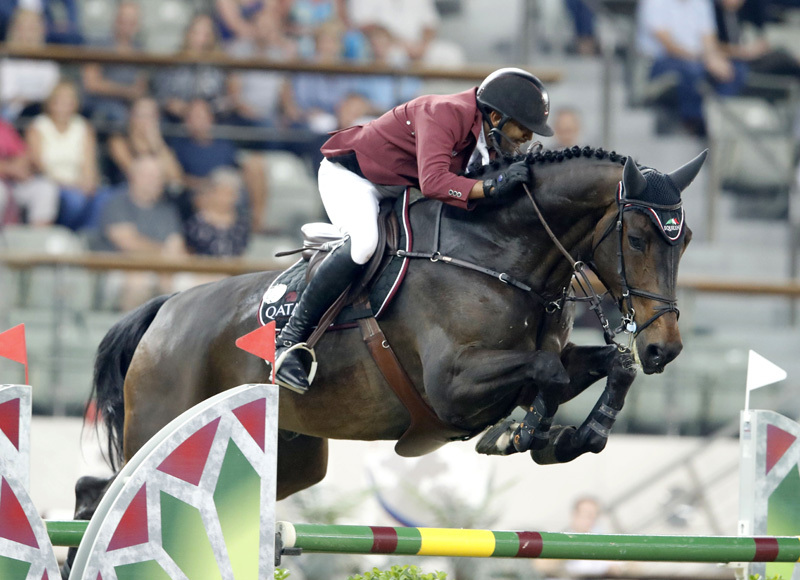 On the night Dutchman Harrie Smolders and his superstar ride Don VHP clocked up 4 faults in the LGCT Grand Prix. But his supreme performance all season had already ensured he was the 2017 series winner. Before the LGCT grand prix began there was intense speculation about which of the top riders would win the remaining podium place in the LGCT overall championship. Lorenzo De Luca arrived in Doha in second position, just ahead of Christian Ahlmann of Germany, fellow Italian Alberto Zorzi, Maikel van der Vleuten of the Netherlands and 2013-2014 title holder Scott Brash, the top six on the leader board separated by a mere 15 points. Brash (Ursula XII), Ahlmann (Taloubet Z) and De Luca (Ensor De Litrange LXII) were all surprise casualties in the qualifying round as their 4-fault rounds left them outside the vital top 24 that return for the grand prix. In the large sand arena a true 1.60-meter test awaited the 24 starters. Uliano Vezzani of Italy had built width on the oxers that was truly daunting, but offered little to worry this top tier field and it proved a generously inviting track. A wide triple bar at Fence 3 to a lofty vertical followed by a two-stride double of water trays at Fence 5 required power and accuracy early on the track. The return of the Longines treble midway round the track typically featured two verticals with a big wide oxer out—it required a big jumping effort and the poles here fell most frequently. Then there was one final punch over the 1.55-meter high, 1.70-meter wide, Longines oxer under the packed grandstands and the 86-second target time proved generous after an end-to-end challenge. A total of nine remained faultless and the stage was set for a fascinating final finale. Smolders couldn’t produce the fairytale finish, just missing out on a jump-off place with an unlucky 4 faults at the double. And when Fair Light van’t Heike put in an uncharacteristic stop at the Longines treble for Zorzi, his chance of a championship podium finish diminished. Only van der Vleuten remained for the leading championship contenders and he was first out of the blocks in the jump-off. The shortened track featured two crucial turns and a tempting run down over the final Longines oxer under the packed stands, and the Dutchman, riding the spirited stallion VDL Groep Verdi TN, set a solid clear in 37.76 seconds. But van der Vleuten exited shaking his head, knowing he’d left the door ajar for his pursuers. European champion Peder Fredricson and H&M Christian K upped the pace whilst remaining well anchored round the pivotal corners and they slipped into the lead in 37.41 seconds. Setting off in top gear, Janika Sprunger and Bacardi VDL pushed all the way round, shaving just a fraction off the Swede’s time to give us another new leader in 37.34 seconds. The young Dutch rider Kevin Jochems, with the scopey chestnut Alcazar Sitte, followed the Swiss rider’s route but ground to a shuddering halt off the bend to the penultimate vertical. 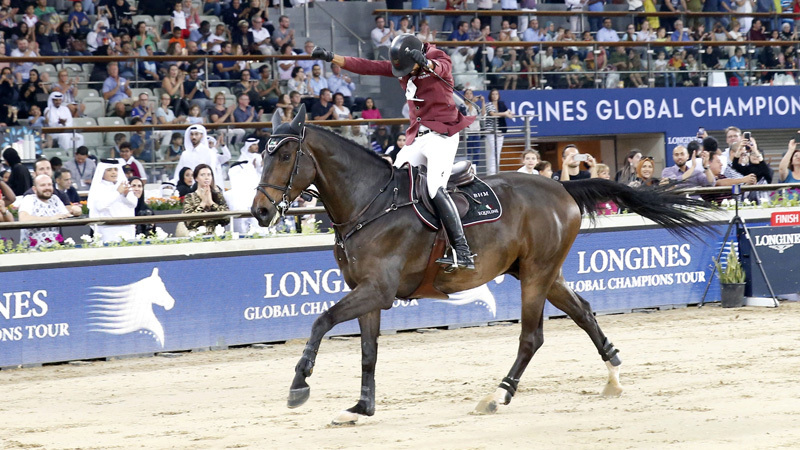 Great applause filled the arena as home rider Bassam Hassan Mohammed and the big striding Gunder powered round. A big push was required to the penultimate fence and he swept home at full pelt and straight into the lead in by a good 2-second margin, to the excitement of home supporters. Edwina Tops-Alexander and California hit a big early vertical then Martin Fuchs and Clooney also posted a 4-fault round. Tension rippled round the stands as, with only two players left to perform, the Qatari rider was guaranteed a podium place. Pieter Devos of Belgium revved through the start and Espoir relished the challenge, showing utmost agility through the double, but succumbing to a rail at the penultimate vertical. It all hinged on last-to-go Kevin Staut of France and Silver Deux De Virton HDC. The speedy Frenchman appeared set for victory, but when the Longines fence fell, the crowd erupted with joy. See full results from the Longines GCT Grand Prix of Doha and the final standings of the Longines GCT series.